How Does Cover Glass Apply Water Drainage Systems into Your Home? Water is the most important substance on earth, regulating our body temperatures and maintaining all other bodily functions that give us life. However, when it comes to water seeping into your home from rain or moisture, it can be your worst nightmare. Without a proper drainage system for your sliding glass doors, water can easily seep into the wood flooring or carpet area, even bleeding behind the walls of your home - leading to devasting mold growth and interior damage. And it doesn't just stop there. When water collects on the exterior of your frameless glass doors, this can also create havoc if they are not properly maintained. Thankfully, that's why here at Cover Glass, we offer several water drainage options for our top hung glass systems that not only keep the interior of your home in perfect condition but also protect the exterior from water build-up. During (heavy) rain or wind-driven moisture, water comes in contact with the exterior glass wall panels and travels to the bottom track area. 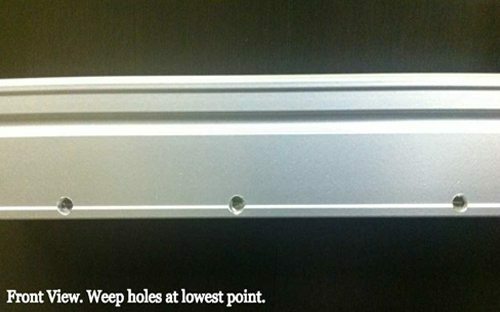 Thanks to gravity, water then flows via the interior weep channel and drains to the outside through the exterior weep hole as water accumulates. Once the glass door system is closed, water seepage - into the interior - is virtually impenetrable and the exterior is protected from stagnate water build-up. How Do We Install Your Water Drainage Systems? Typically, we will apply one weep hole per window panel, however, we always take into account project needs and will consult with you the best option. With this process, there are typically two alternatives you will consult you with. a.) Attach drain pipes to the lowest point at the front of the track. 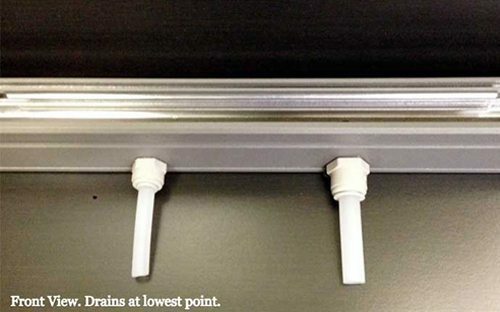 As depicted, our drain pipes come in either 1/2" or 3/8" W and are made of durable yet flexible polycarbonate that can be covered completely. b.) Attach drain pipes directly underneath the track to remove any water build-up that may accumulate. As you can see, Cover Glass does not just install beautiful frameless glass doors. We also work with you, your contractors or your architects to create sliding glass door drainage systems that seamlessly protect your home from Mother Nature. Without a state-of-the-art drainage and waterproofing mechanism installed into your sliding glass door system, you leave your home vulnerable to not only unsightly structural interior damage but also increase the risk of respiratory problems, fungal infections, unsightly mold and unpleasant smells. At the end of the day, we’re here to make your home more livable, efficient and beautiful. So, get in touch with us now to start creating a beautiful addition to your home, but one that is protected and engineered to perfection.